I get so mad when I am at work and a button pops off my shirt or I notice a small hole in my shirt. I always think I just need to have a sewing kit here at work. 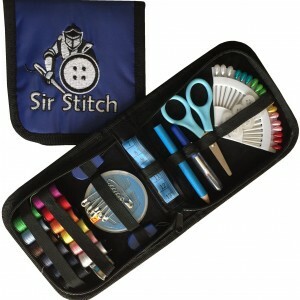 I recently received this Sir Stitch Professional Sewing Kit and it is perfect to leave in my desk at work. It would be the perfect size to keep in your purse, briefcase, backpack and car. Great to take traveling, camping and anywhere you may need a quick fix. The Sir Stitch Professional Sewing Kit includes every thing you need. It includes needles in a case, threaders with plastic handles, 12 spools of thread in popular color, measuring tape, thimble, seam ripper, scissors, straight pins in case, large and small safety pins, large and small shirt buttons and a fabric pencil. It all comes in a zippered case. I have already used my sewing kit a couple times at work. I needed to fix a hem and someone else in the office needed to fix a button. I was glad to have it with me. This looks like the perfect little kit to give for to a beginning sewer. If you would like to purchase your own Sir Stitch Professional Sewing Kit you can do so on the link below.